If you’re trying to fill a job order for a sales manager, then you need excellent sales manager interview questions. When you use the best interview questions for sales managers, you can find the most qualified candidates to send to your client. You can also use the interview questions to help your candidates practice for their interview with your client. And, if your client wants to learn how to interview a sales manager better, you can send your client a list of potential questions to ask. There are thousands of interview questions to ask candidates. How do you know which are the best interview questions for sales manager candidates? Here are 43 sales manager interview questions to ask. 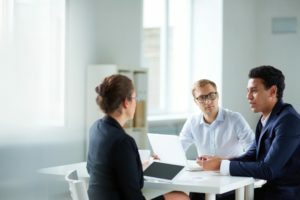 Behavioral interview questions help you learn more about the candidate’s character and reactions in certain situations. You can ask behavioral questions about many situations to learn about specific reactions. How do you communicate with people you don’t get along with? How comfortable are you with public speaking and presenting data? Think about a time when you had to give a presentation. How did you prepare? Describe a time when you had to give a presentation without preparation. What did you do? Can you tell me about a time you disagreed with a manager? What did you do? How do you handle conflicts among your team? Can you tell me about a time you had to analyze information? What was your process? Can you tell me about a time when you used your analytical skills to find a solution to a problem? Describe a project that demonstrated your analytical skills. What steps do you take before making a decision? Can you tell me about a time when you had to make an immediate decision? How did you make the decision quickly? Have you made a decision that was unpopular with your sales team? What did you do? What’s the most difficult decision you’ve made at work? These are general experience questions. What degrees or certifications do you have? How does your previous education improve your job skills? How have your previous jobs prepared you for this job? What is your management experience? These questions will help you better understand the candidate’s management style. What is your greatest achievement as a manager? What is the most difficult part of being a manager? How do you lead a difficult group? How do you set goals for your team? How do you track the goals? How do you ensure your team meets the goals? How many people have you been responsible for managing at one time? The following are specific interview questions for sales manager candidates. These questions will go beyond general questions to learn how qualified candidates are for the specific position. What skills do you think a successful sales rep needs? How do you show those skills? How will you identify those skills in others when adding new reps to the team? What do you think motivates sales reps the most? How will you motivate your sales reps? How would you coach sales reps under you? What is the most effective way to train new sales reps? How closely do you like to work with other sales reps? What would you say to a sales rep who has repeatedly missed their quotas? What was your most successful sale? Why was it so successful? How did you make the sale? Tell me about a time when you had to negotiate with a difficult customer to make a sale. What did you do? What was the outcome? What sales software are you able to use? How quickly could you learn new software? How strong are your data analysis skills? How would you develop a sales strategy for a new product? What is the most difficult part of sales for you? How do you get past that? How often are you willing to travel? How flexible are you? When you ask regional sales manager interview questions, take notes about candidates’ responses. Your notes will help you select the right candidates to send to your client. Store the notes in your applicant tracking system for recruiters (ATS). Even if a candidate isn’t a good fit this time, they might be a better fit for a future job order. Your notes in your ATS can help you remember the candidate. PreviousPrevious post:10 Reasons to use a Retained Search FirmNextNext post:According to Gallup’s U.S. employee engagement survey, a third of American workers are engaged.